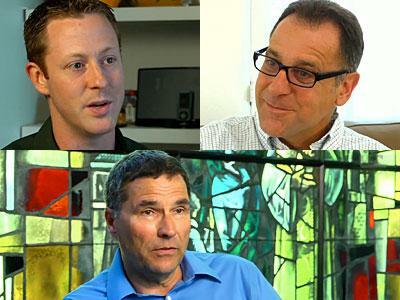 Jesuit Video Series Asks, "Who Are We to Judge?" A Jesuit production company is highlighting the experiences of LGBT Catholics in a YouTube series called Who Are We to Judge?, a reference Pope Francis’s response when asked about gay priests last summer. Rev. Eddie Siebert, president of Culver City, California-based Loyola Productions, said that the series creates a space for LGBT Catholics to share their faith stories. Though some conservative Catholic groups have criticized the project, Siebert said the response has been overwhelmingly positive. – full report at Advocate.com. When Bishop Gene Robinson delivered the keynote address at More Light Presbyterians celebration dinner at 2012 General Assembly, he came under fierce attack in some quarters for some words about the value of MLP “sowing confusion” in the Presbyterian Church. This reaction was based on not only complete lack of understanding of what Robinson was getting at, but also and more seriously, a failure to see that the whole point of the Gospels is not as a defender of a traditional status quo, but as a transformative instrument, allowing the Holy Spirit to enter and transform our lives – and our societies. Jesus says this really astounding thing: “There is much that I would teach you. But you cannot bear it right now. So I will send the Holy Spirit who will lead you into all truth” (John 16:12-13). Don’t for a minute think that God is done with you, and those who come after you. Does anyone doubt that we were led by the Holy Spirit to turn our backs on defending slavery using Scripture? Is it not the Holy Spirit that is leading us to a fuller understanding of the gifts, integrities and experiences of women? And I would say that the Holy Spirit is leading us to recognize gay, lesbian, bisexual and transgender people. We should see this as a sign of a living God. We don’t worship a God who stopped revealing God’s self at the end of the first century when the canon of scripture was closed. At “An Inch at a time”, Rev Susan Russell has placed a video of the sermon she delivered on how to approach the bible sensibly – with respect, and also rationally, with a post titled “On taking the Bible too seriously to take it literally“. The her words are filled with abundant good sense. Watch, listen – and reflect. On “The Daily Show” recently, Jon Stewart grilled Mike Huckabee about a TV ad in which Huckabee urged voters to support “biblical values” at the voting box. And there’s a big problem, Stewart went on, with reducing “biblical values” to one or two social issues such as abortion and gay marriage, while ignoring issues such as poverty and immigration reform. Noting that the Bible is not a “position paper”, but an eclectic assortment of texts written over thousands of years (just the point that Rev Russell makes), she turns to the abuse of biblical texts by some in attempts to enforce particular views on the place of women in the church. In my faith community, popular women pastors such as Joyce Meyer were considered unbiblical for preaching from the pulpit in violation of the apostle Paul’s restriction in 1 Timothy 2:12 (“I do not permit a woman to teach or to have authority over a man; she must be silent”), while Amish women were considered legalistic for covering their heads in compliance with his instructions in 1 Corinthians 11:5 (“Every woman who prays or prophesies with her head uncovered dishonors her head”). The fact of the matter is, we all pick and choose. We’re all selective in our interpretation and application of the biblical text. The better question to ask one another is why we pick and choose the way that we do, why we emphasis some passages and not others. This, I believe, will elevate the conversation so that we’re using the Bible, not as a blunt weapon, but as a starting point for dialogue. Today (5 November) sees the launch of a new campaign focusing on gay parenting rights throughout Europe. The short film, entitled Invisible Parents, features the voice of a woman reminiscing about a happy childhood with her two fathers, before stating that the majority of Europe does not recognize families with gay parents. The film is directed by Mike Buonaiuto, the man behind Homecoming, the video that went viral earlier this year. Invisible Parents launches to coincide with the UK’s National Adoption Week. Michael Cashman, Member of European Parliament, is fully supporting the campaign. He said: ‘Gay and lesbian parents can often find themselves legally invisible in a large percentage of the continent, putting their entire family in a very vulnerable situation especially with regard to healthcare, holidays or family legal systems.